Map of Lake Houston. Courtesy of Texas Parks and Wildlife. Image available on the Internet and included in accordance with Title 17 U.S.C. Section 107. Lake Houston. Courtesy of Texas Water Development Board. Image available on the Internet and included in accordance with Title 17 U.S.C. Section 107. LAKE HOUSTON. Lake Houston lies on the San Jacinto River four miles north of Sheldon and eighteen miles northeast of Houston in Harris County (centered at 29°55' N, 95°08' W). The man-made lake is held by the sixty-two-foot-high earthfill San Jacinto Dam and concrete spillway section, engineered by Ambursen Engineering. The lake is owned and operated by the City of Houston for municipal, industrial, recreational, mining, and irrigation purposes. Construction began in November 1951, and the dam was completed in December 1953. 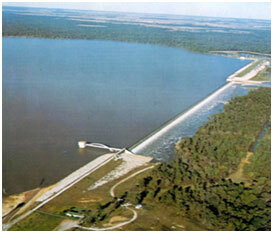 A sedimentation survey made in 1965 records a storage capacity of 146,700 acre-feet and a surface area of 12,240 acres at the spillway crest elevation of 43.8 feet above mean sea level. The drainage area above the dam is 2,828 square miles. The dam, just below the confluence of the east and west forks that form the San Jacinto River, is three miles upstream from Magnolia Gardens. The lake is crossed by the Missouri Pacific line at the McKay Bridge and by Farm Road 1960. Handbook of Texas Online, Seth D. Breeding, "LAKE HOUSTON," accessed April 24, 2019, http://www.tshaonline.org/handbook/online/articles/rol42.